In most K-12 schools, curricular decisions are shaped by many factors, including local, state and national guidelines, student and parent expectations, and available resources. In the case of online schools, some of these factors continue to shape the curriculum but virtual high schools, such as Stanford Online High School, also experience a degree of curricular freedom rarely found in traditional schools. The result is a curriculum that is not only more global in scope but also free to more effectively respond to individual learners’ needs. Dr. Anthony Smith joined Stanford OHS in 2010 as a humanities teacher. Now the Director of Curriculum, Smith has watched the school’s evolution over the past seven years and played a key role in its growth. As Smith explains, although the school has grown rapidly, it has always remained mindful of making careful decisions about next steps, especially when it comes to the curriculum. “On a broad level, the online nature of the institution liberates us to do things we couldn’t do in a traditional school environment,” explains Smith. “We get fantastic kids who are ready to engage with challenging material, so we can offer courses that we would not be able to offer otherwise.” In addition, the types of materials taught in many of Stanford OHS’s courses are often more challenging. As Smith notes, Stanford OHS students frequently encounter materials that they would typically not encounter until college. Smith also emphasizes that the curriculum is impacted by the school’s international student body who bring very different expectations to bear on the curriculum: “It’s possible to have a course with students located on four continents, and when this happens, students don’t always have a perceived idea of what comes next in the curriculum—nor do their parents.” As an example, Smith—who also teaches history at the school—observes that teachers at Stanford OHS can never assume that everyone in the class has had an identical education. “Students in my classes may have been studying American history throughout their education or be encountering it for the first time in tenth or eleventh grade—this affects how and what we teach and it also fosters critical dialogue,” says Smith. Before the rise of mandatory schooling, all classrooms were based on ability rather than age. Indeed, this is what enabled the sixteenth-century philosopher Petrus Ramus to reportedly start university at the age of seven. 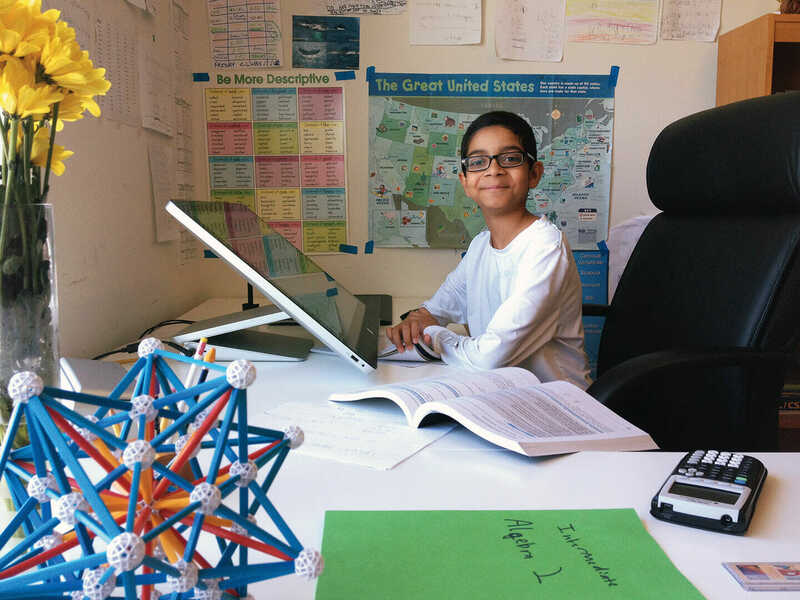 While Stanford OHS certainly doesn’t admit students as young as seven years (the school recommends that applicants applying for entry in seventh grade be at least 11 or 12 years of age at the time they apply), as stated on the school’s website, “Stanford OHS places students by ability rather than age or grade level.” As a result of this bold decision, a ninth grader who can do university-level calculus is free to take a class reflecting their ability. Notably, Stanford OHS currently offers 23 post-AP/college-level courses across subjects, so there is also ample opportunity available for students who are able and eager to advance more quickly. While Stanford OHS certainly enjoys a degree of curricular freedom not found in most high schools, it still takes accountability seriously. As a school based in California, Stanford OHS does adhere to certain California-based standards. The school also must meet standards set by the Western Association of Schools and Colleges (WASC). In addition, since the school offers several Advanced Placement (AP) courses, it must also adhere to guidelines established by the College Board. The school is also highly accountable to its student body and to students’ parents. Is Amazon Building Its Own LMS?